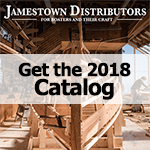 Jamestown Distributors carries power planers from DeWalt and Festool. Electric planers make an easy job of large projects. Planers work great in fine woodworking as well as fixing framing in home building. DeWalt has proven to produce well constructed power tools for any application. The DeWalt planer is perfect for beginner planer or for the contractor that uses one every day. Festool is one of the top of the line power tool companies in the world today. The Festool planer has a precise depth adjustment and the chip collection port work on either side of the planer. This Planer is the top of the line for finish carpentry, when the highest grade results are required.